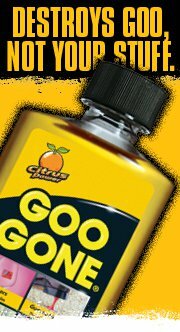 As many of you already know, I'm a HUGE fan of Goo Gone. I loved it before having a kiddo and love it even more now that I have a curious little boy. I find that it cleans up most messes the little guy creates (have you ever tried to remove crayon from, well, just about anything? It's a breeze with Goo Gone) and of course, even those I create all by myself. Today I'm honored to be the Goo Gone GooRu and in celebration, would like to give one lucky reader a fresh new bottle of original Goo Gone. To enter, leave a comment on this post and if you'd like, tell me how Goo Gone has saved your tail. Don't forget to leave your e-mail address so I know how to get your mailing information to send you your bottle. 3) Follow Goo Gone on Facebook and leave a comment here to let me know. This contest will end at noon PST on Monday, September 26 and the winner will be randomly selected.